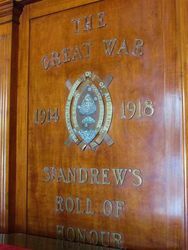 St Andrew`s Roll of Honour commemorates those from the congregation who served in World War One. Special services conducted in St: Andrew's Presbyterian Church, Laman street, Newcastle. 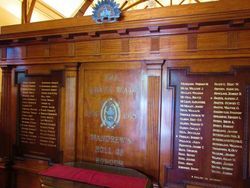 Sunday, on the occasion of the unveiling of the roll of honour erected to commemorate the service and sacrifice of the men of the congregation in the great war, 1914-1918. At the eleven o'clock service Brigadier-General Paton will unveil the memorial. The Moderator Generator of the Presbyterian Church of Australia, the Right Rev Dr. Scott-West, will be the preacher, and will dedicate the roll of honour. 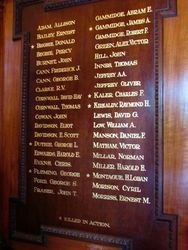 The memorial screen embodying it is situated in a dominating position in the main porch of the church. It is made of Queensland maple, designed in the Doric order of architecture, and consists of based fluted columns, and pilasters and entablature, three panels, the centre one bearing an indication of the object of the screen in cast bronze letters, and incorporating the crest of the Presbyterian Church of Australia. The two side panels are enriched with egg and dart moulding and bear the names in gold of 78 men who offered their services in the war, nine of them made the supreme sacrifice. On the entablature immediately above the centre panel is the A.I.F cast in bronze. The castings are the work of Messrs. J. Castle and Sons, Sydney. 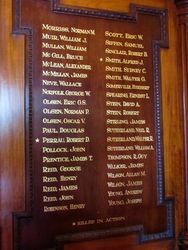 Mr W. Fraser of Hamilton, was responsible for the entire woodwork to the design of Messrs. F. G. and A.C. Castleden, Newcastle. The whole makes a most imposing work of art, and is worthy not only of the object to which it is devoted, but also of the church and the city. Newcastle Morning Herald and Miners' Advocate (NSW), 29 March 1927.